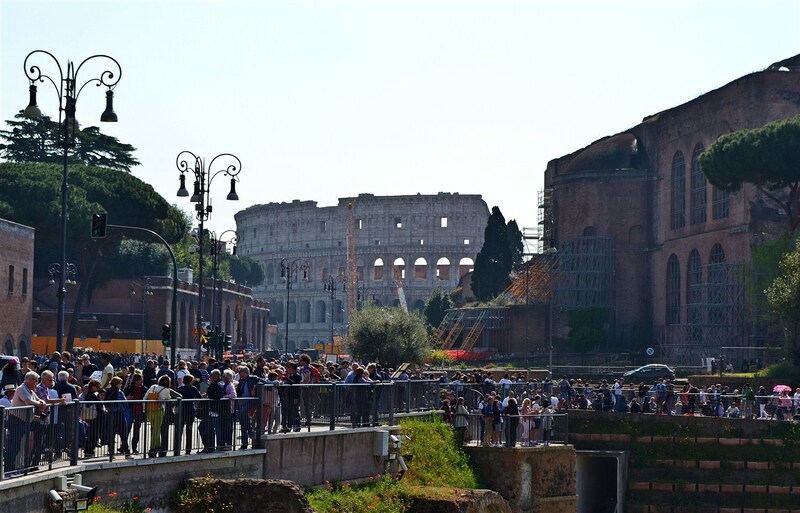 By the time we reached the Colosseum area it was late morning and naturally the place was packed. 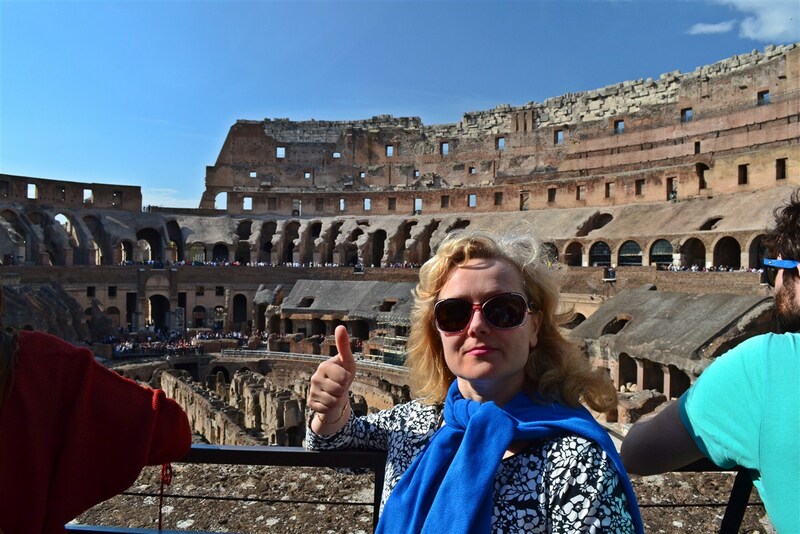 The thing to do there is buy a combo ticket which gets you into all three of the Colosseum, Palatine Hill, and Roman Forum. It’s cheaper than separate entrance fees, you only have to stand in line once and it’s good for one entrance to each attraction anytime over the course of two days. 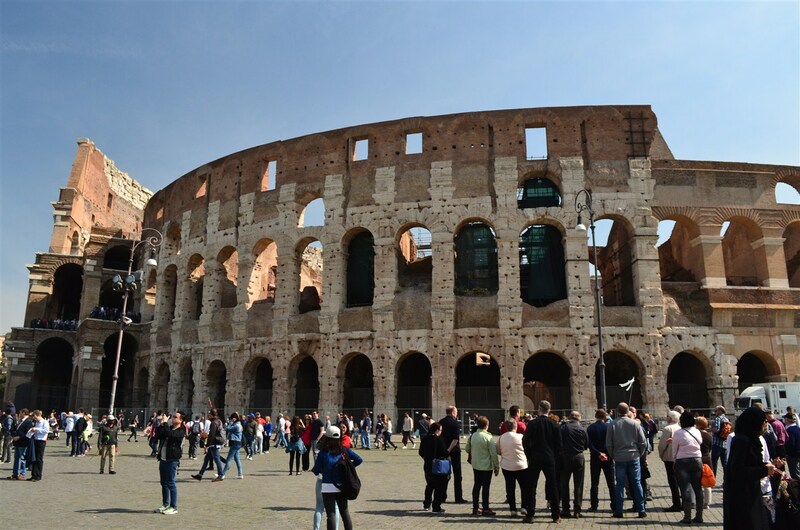 As the ticket lines were humongous at the Colosseum, we opted to stroll down the street and begin our day at the Palatine Hill where it was less crowded, then go through the Forum and end at the Colosseum. An ambitious agenda, but it would be our last full day in Rome and we wanted to see them all. Besides, we believe if we don’t return to our hotel room at night exhausted, we didn’t do enough that day. 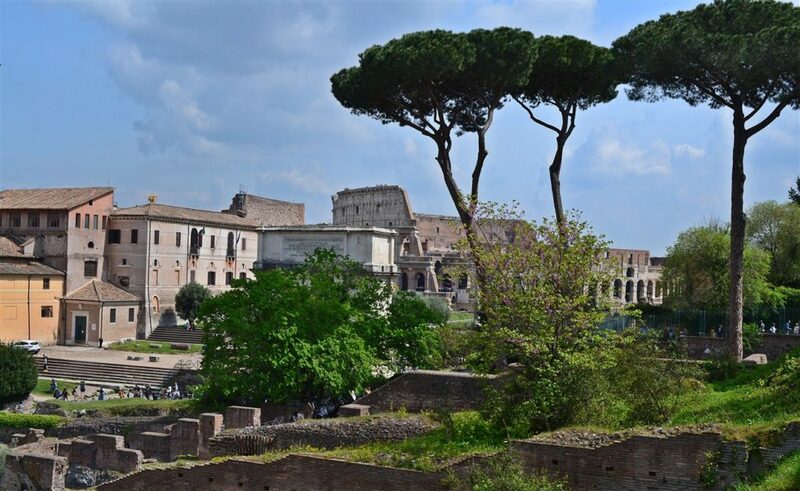 The Palatine Hill and Forum are both fabulous areas to wander through if you’re any kind of history buff, and I’ll be coming back to cover them in my next article. 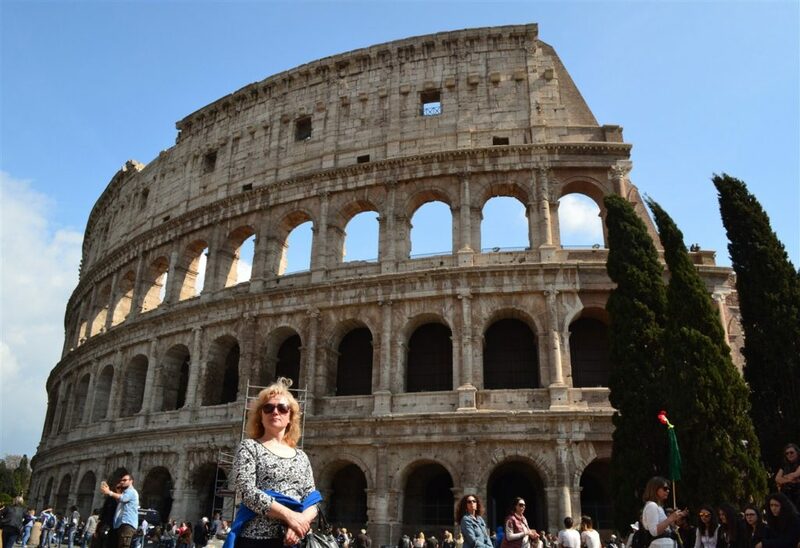 By the time we moved on to the Colosseum it was nearing four o’clock. The crowds were thick but perhaps not quite so massive as earlier in the day. It still took us about fifteen minutes to shuffle through the inevitable security lines which are an unfortunate fact of life everywhere nowadays. Ready to enter? Let’s go! 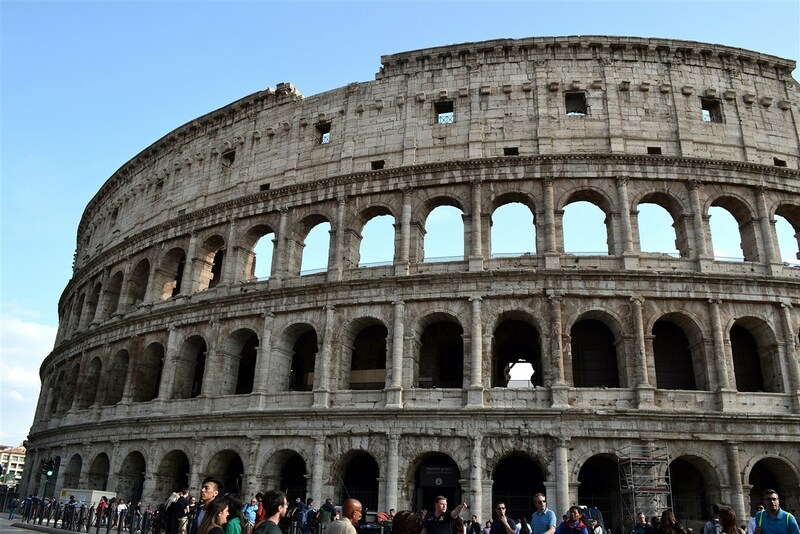 Entering the Colosseum was another of those awe-inducing travel moments for me, finally seeing a place you’ve read about and seen innumerable photos of throughout your life. 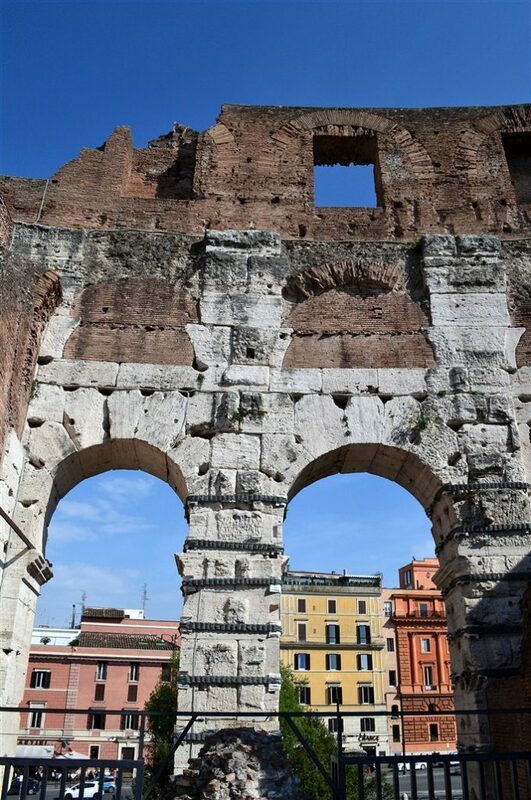 Still, nothing can prepare you for the moment you step inside those walls and gaze around and realize you’re standing where others stood two thousand years ago. If you have any imagination it isn’t difficult to picture yourself in the midst of a sea of togas and settling into the stands to watch yet another bloodbath spectacle played out on the sands of the arena below. And let’s be honest, that’s what this place was, a theater of blood, a slaughterhouse of both humans and animals. If you don’t already know the history of what went on here, they do a fine job of informing you as you walk around the interior, even without paying for a personal tour guide. 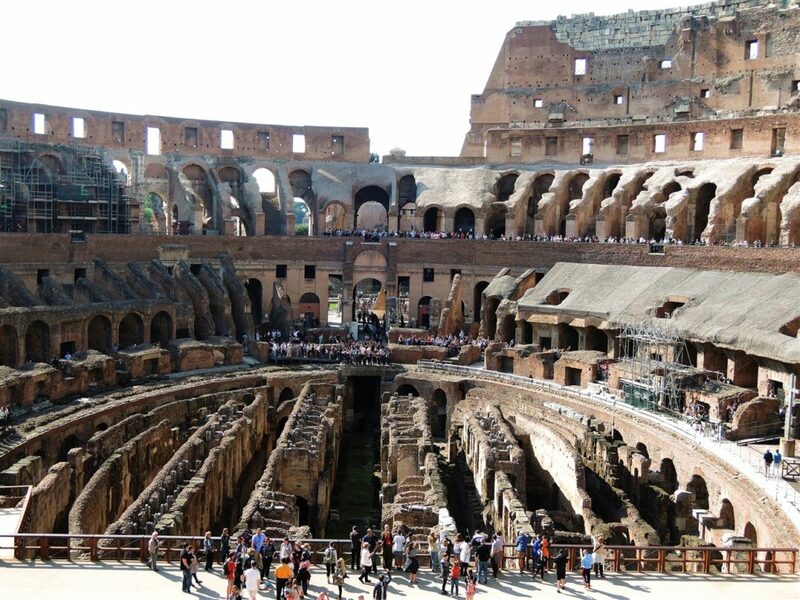 There are lots of placards at various locations detailing all manner of Colosseum related facts, stories and trivia. 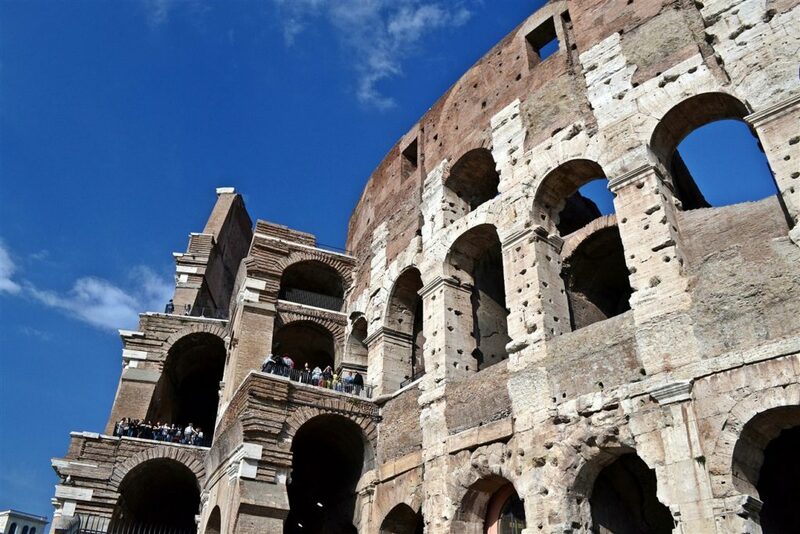 The Colosseum’s original Latin name was Amphitheatrum Flavium, or Flavian Amphitheatre, as the building was constructed by emperors of the Flavian dynasty following the reign of Nero. 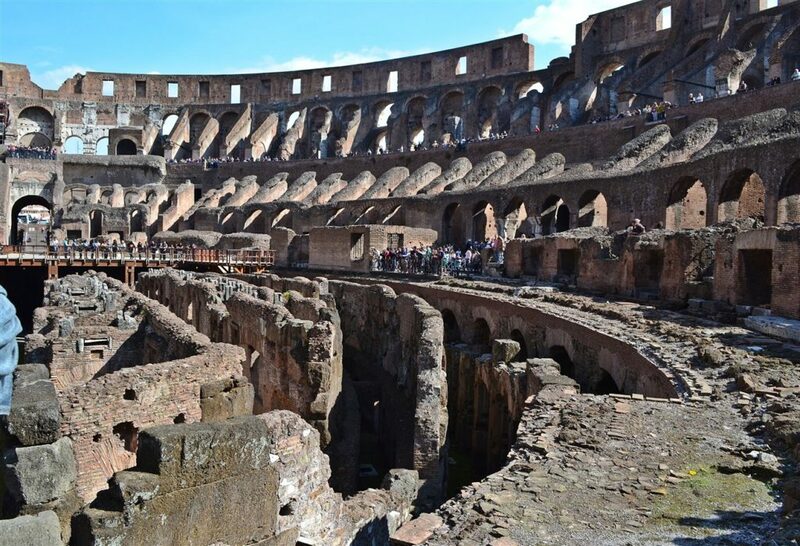 Built of concrete, sand, and travertine stone, it is the largest amphitheatre ever built. 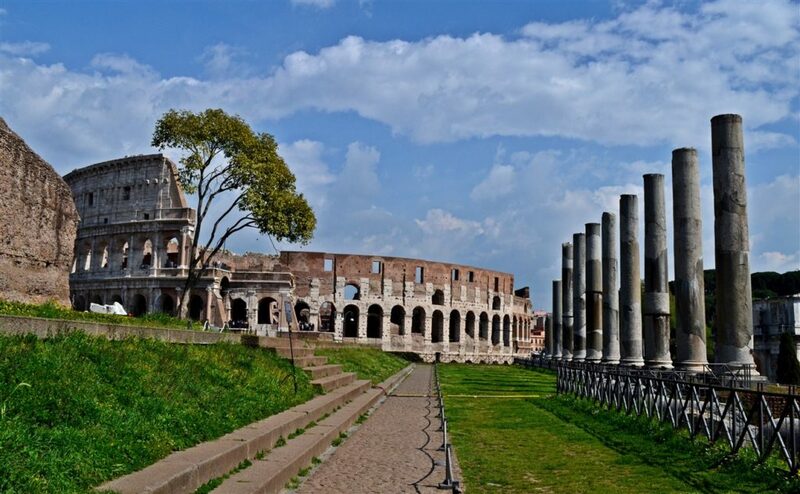 Construction began under the emperor Vespasian in AD 72 and was completed in AD 80 under his successor and heir Titus. Further modifications were made during the reign of Domitian (81–96). 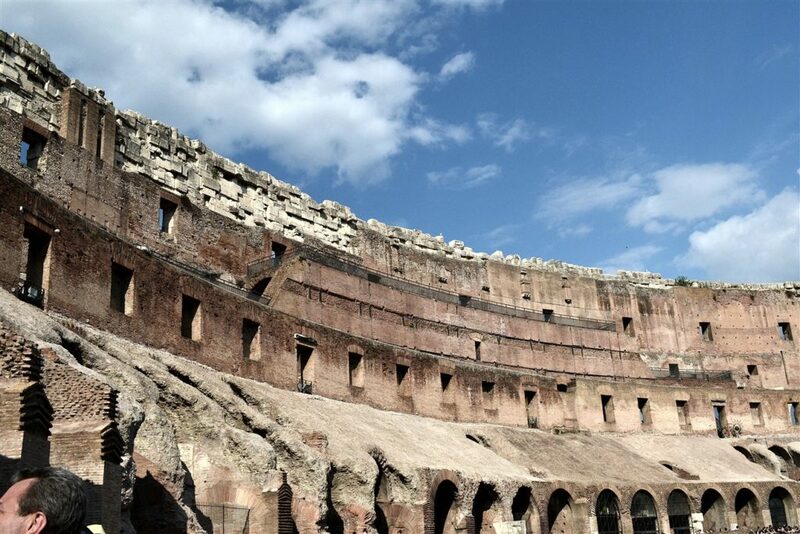 The Colosseum could hold between 50,000 and 80,000 spectators, depending on which historian you believe. The Colosseum was, of course, most famously used for gladiatorial contests, but also for other public spectacles such as mock sea battles (for only a short time as the area which could be flooded to do this was soon filled in with mechanisms to support the other activities), animal hunts, executions, re-enactments of famous battles, and dramas based on Classical mythology. The building ceased to be used for entertainment in the early medieval era. It subsequently was turned into housing, workshops, a fortress, a quarry, and a Christian shrine. 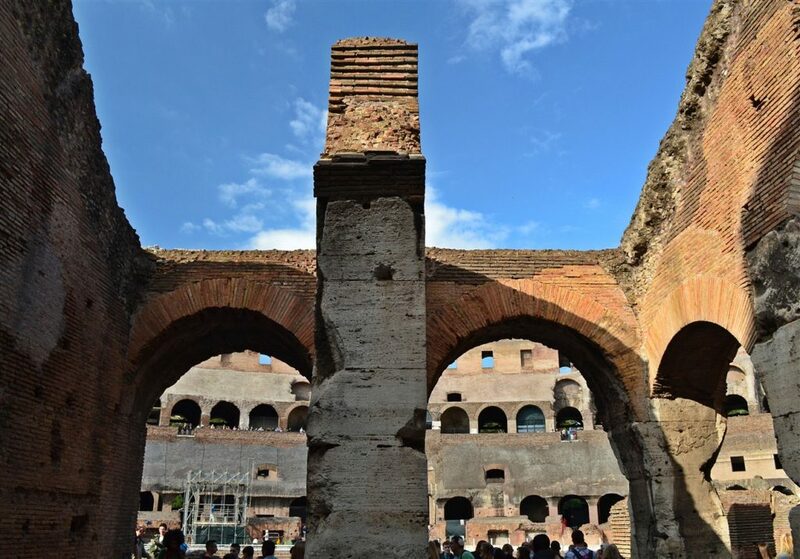 Fires, earthquakes and “re-purposing” (chunks being chipped off and used to build other structures) all took their toll on the structure through the centuries, but it’s a testament to the marvel of Roman engineering that so much of the original building still stands to this day. 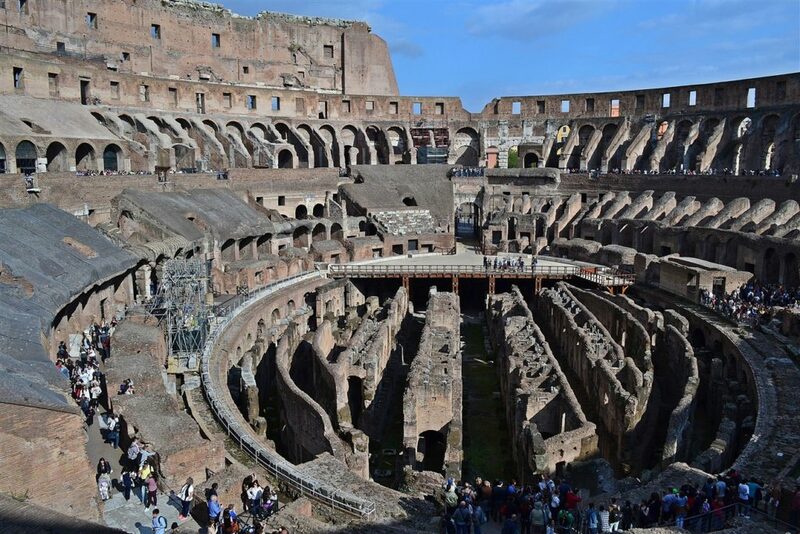 As I alluded to earlier, the history of the Colosseum and its original purpose as an “entertainment” venue is one which is covered in blood. For the Romans, entertainment seems to have been synonymous with bloodshed, and your reaction to visiting this site may depend on how you feel about the idea of 50,000 Romans cheering wildly and reveling in the mauling, dismemberment and death of countless thousands of people and wild animals, and whether or not that constitutes entertainment. For me, well, it all happened a long time ago and I didn’t personally know any of these folks or have to watch it happen. Yes, it seems incredibly barbaric and savage and bloodthirtsty to us today, but I try to simply view it in a historical context. Different times, different social norms and standards. We might like to think we’re more highly evolved and have progressed beyond such things now, but my hunch is if you put any one of us back there, born and raised in that society, I doubt we’d be any different. We spent a good ninety minutes inside the walls, exploring as much of the first and second levels as we could gain access to. Some areas were cordoned off, including the entire upper tier, which was disappointing personally as I wanted to cover every square inch of the place. Also it seemed to me the upper tier would provide the best photo vantage points but I was forced to make do with what was available. 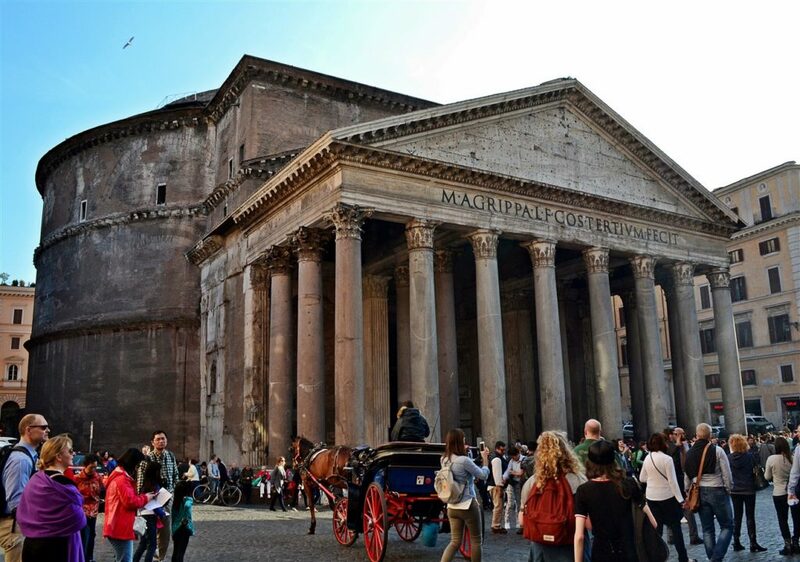 We would have hung around longer but it had already been a full day and we still wanted to walk to the Pantheon. That took about thirty minutes and despite being tired and footsore at that point, it was well worth it. Visiting the Pantheon immediately after spending the day viewing all the most famous Roman ruins in varying stages of decay turned out to be a splendid idea, as the Pantheon is by far the most well preserved artifact of ancient Rome. 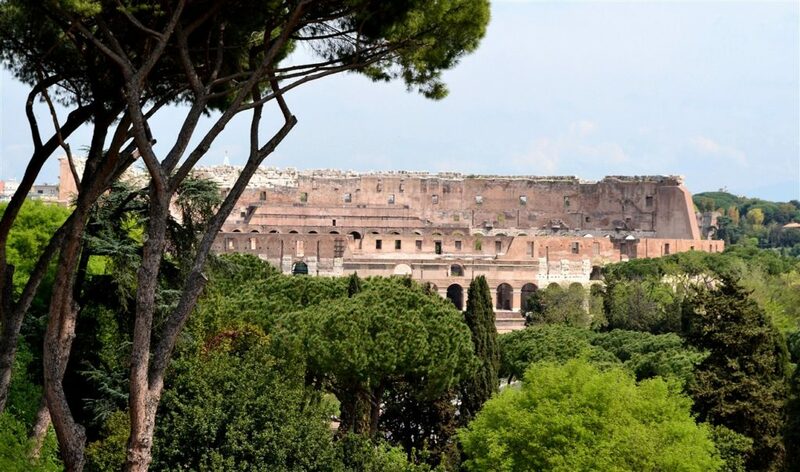 Originally built as a temple to all the gods (hence the name) the present building was completed by the emperor Hadrian and probably dedicated about 126 AD. The building is circular with a portico of large granite Corinthian columns, a rectangular vestibule which links the porch to the rotunda, and all of it a dull, dark gray not all that impressive when viewed from the outside. Inside is where the true wonder is revealed, under a coffered concrete dome, with a central opening, or oculus, to the sky. 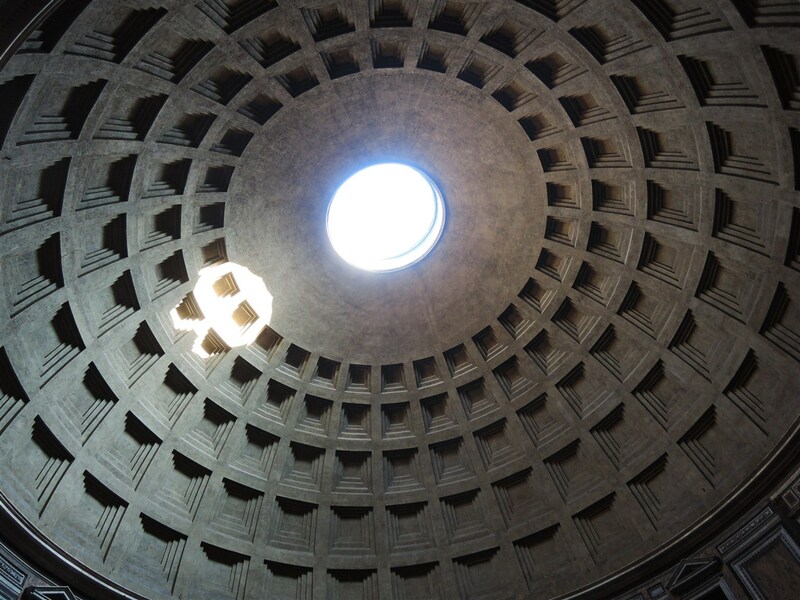 Almost two thousand years after it was built, the Pantheon’s dome is still the world’s largest unreinforced concrete dome. 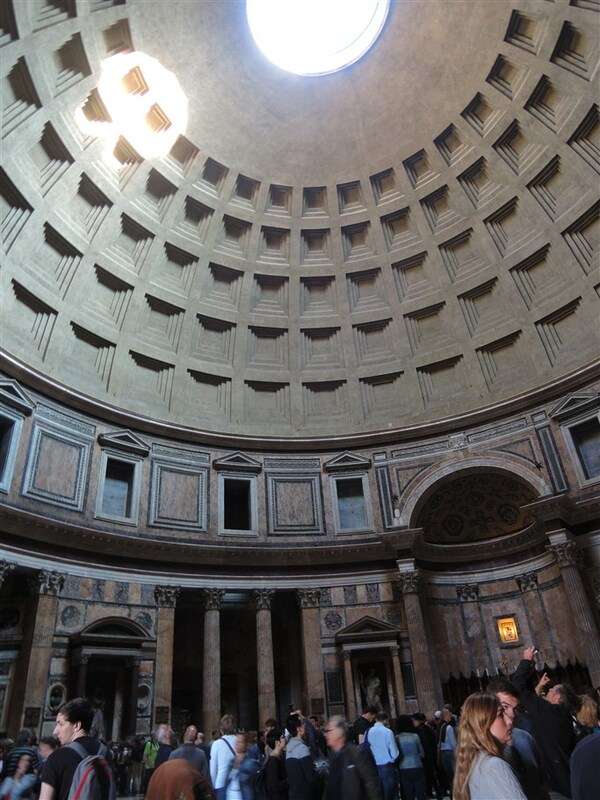 The height to the oculus and the diameter of the interior circle are the same, 142 feet (43 m), a perfect sphere. 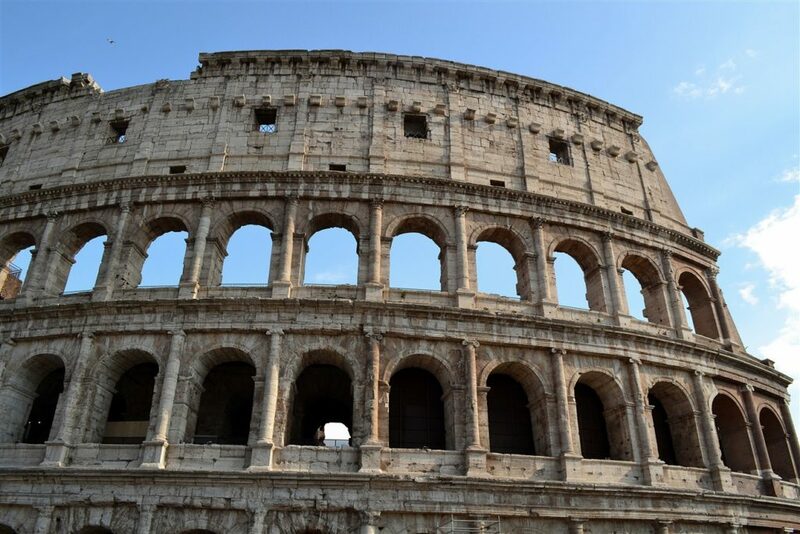 Modern engineers still marvel at how the Romans constructed the place using ancient technology. The building has been in constant use for two thousand years, and has been a Catholic church since about the year 700 A.D. When we arrived the lines to enter looked long, but they moved very quickly and we were inside within five minutes. One of the highlights inside is the tomb of the Renaissance painter, Raphael. 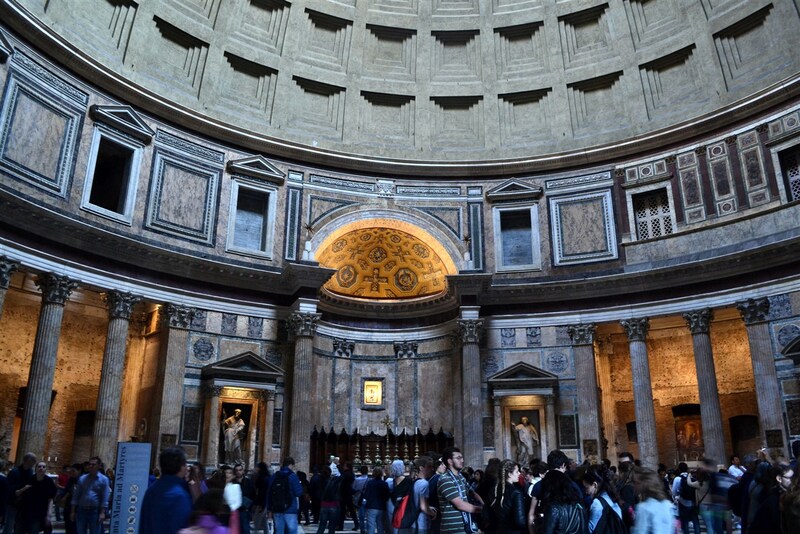 Best of all, the Pantheon is free to enter. 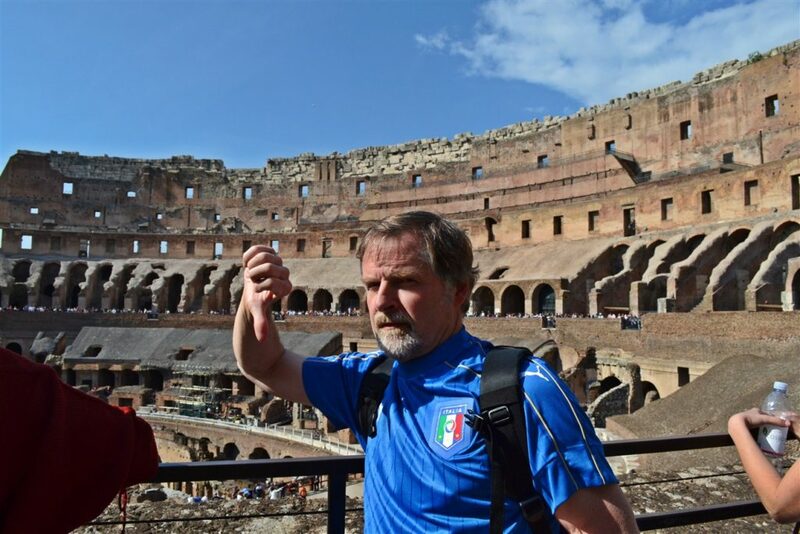 If you’re in Rome, don’t miss it.